A precision investment casting, rapid prototyping and machining company is one of the only vertically integrated casting companies in the industry, providing customers with a complete slate of services from CAD drawings and prototyping to complete finished assembly. Industries served include defense, oil & gas, aerospace, industrial turbines and medical. The company was struggling to refinance its existing lender and retained Concord to run the refinancing process. 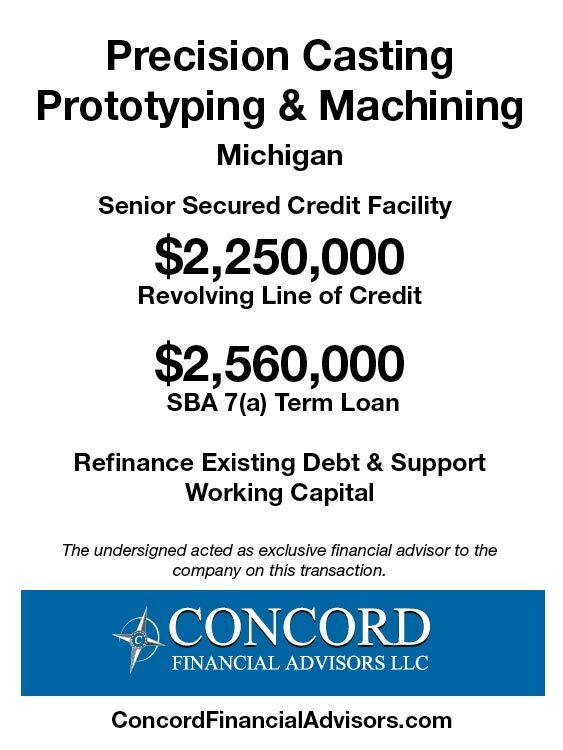 Concord quickly identified the key to a new transaction required SBA 7(a) financing. The new term financing would allow the company to service its existing debt over a longer amortization period and free up near term cash flow. Concord created a detailed memorandum featuring the Company’s strong management team, competitive strengths in its market and highlighted the plan to maintain and grow profitability and cash flow. After conducting a targeted search process to local, regional and national commercial banks Concord secured a commercial banking proposal that met the Company’s objectives.